Michael McFadyen's Scuba Diving - Anemone Bay, North Solitary Island The North Coast of New South Wales has some fantastic diving, none of which is better than the hundreds of dive sites on the Solitary Islands. On 15 May 1770, Lieutenant James Cook in HM Bark Endeavour passed a small group of islands off what is now Coffs Harbour and named them the Solitary Islands. Unfortunately the sun was setting as he approached the southern-most islands and he passed by them during the night. A pity as he may have examined them closer and found the delights that today attract divers from all over Australia. The northern-most of the islands is North Solitary Island. From Mullaway it takes about 45 minutes (to travel the 23 kilometres) and from Wooli it takes about 20 minutes to travel the 14 kilometres (bigger, faster boat). There are a dozen or so dive locations around the island. The most famous of these is Anemone Bay on the northern side of the island. 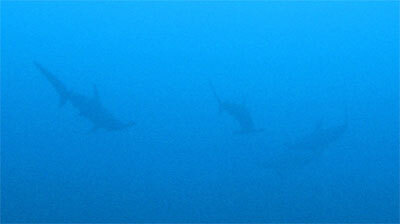 This bay is perhaps 200 metres wide by 75 metres long, but the dive location runs out another 75 metres or so. The GPS Reading is latitude of 29� 55' 31" S and longitude of 153� 23' 10" E. Note that all the GPS Readings on my Web Site are taken using AUS66 as the map datum. If you use another datum you may be about 220 metres off the site. See my GPS Page for more details and how to convert readings. As can be imagined from the name, Anemone Bay gets its name from the fact that there are lots, and I mean lots, of anemones in the shallower parts of the bay. Various reports place the concentration and number of anemones here as being the highest in the World. However, I have also heard it said that it is the fourth highest. My view is that the southern side of the north-western point of North Solitary Island has even more than Anemone Bay! In any case, it suffices to say that there are many, certainly in the tens of thousands. The bay consists of a shallow part closer to the island with a depth ranging from five metres to about 12 metres at the head of the bay to just ofver 15 metres on the eastern side. This reef drops a few metres (at the head of the bay) or over five metres further out to a bottom that is various composed of sand with some small isolated coral bommies. The bay has at least three moorings that enable different starting and finishing locations on dives. My favourite way of diving here is to start at the Shark Gutters mooring which is in the north-east of the bay. This is located right on the edge of the reef and attached to a huge boulder. From here you do a one way drift (without current), to the mooring at the head of the bay. Once you descend you will see the huge boulder that holds the mooring in place. The depth at the bottom of the boulder is almost 23 meters and this is the edge of a sort of small wall. In this area you can see turtles, eagle rays, manta rays and sometimes Queensland gropers. To the north-east is the Shark Gutters where the depth is about 25 to 27 metres, depending on where you go. In Winter there are normally grey nurse sharks here and during the rest of the year you may still see them (I have seen them at all times of the year). If you only doing the dive out and back to this same mooring, you can swim to the south-east from the gutters. The depth drops to almost 30 metres and there are nomrally some Queensland gropers and estuary cod in this area. If you go out further the depth can get to 40 metres. Turning south and then west and depth comes up to 23 metres. 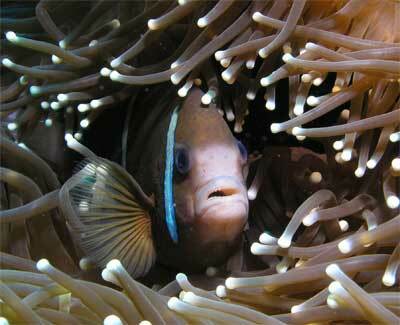 There are hundreds of species of tropical fish as well as large numbers of bream, surgeonfish and wobbegongs. Since you have gone deep, you will probably not have the longest of dives so it may be time to return to the mooring. If you are doing the drift dive, head out from the Shark Gutters to the north and you may have some fantastic encounters. One one dive here in 2005 I saw a white-spotted shovelnosed ray, a black whaler and five hammerhead sharks in less than five minutes. Once you have seen these (I hope! 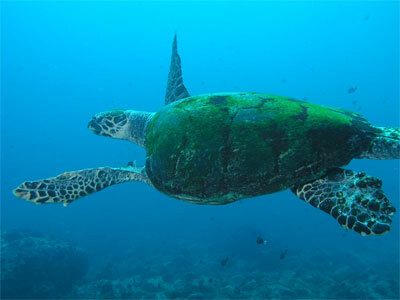 ), swim back to the south till you are in the area of the reef wall. You will be back in about 20 to 22 metres. Follow this wall to the west (keeping it on your left). The depth will gradually come up. On the bottom here there are isolated rocks and off the wall some larger boulders. As you go you will see that the number of anemones increases. You will also see a number of cleaning stations where fish of all sizes line up to be attended to by cleanerfish. They dart in and out of the fishes' mouth and gills and pick at all parts of their bodies, taking away any dead skin and remains of food. The stations are quite popular, not only with the divers but the fish, with up to three or four fish in line at some spots. If you are a photographer (and even if you are not) pick out a clear spot (hard to find now but much easier in the early 1990s) and lie on the bottom watching a cleaner station for a few minutes. Fascinating! The wall turns towards the south and the depth comes up to 18 and then 14 metres or so. As you go you will see large schools of bream, diagonal-banded sweetlips, kingfish and even some clown triggerfish. You will go past a mooring and then another old mooring that does not reach the surface. Finally you will see the mooring where the dive boat should be waiting. On you left now is a sort of plateau that has thousands of more anemones. Each one has three or four clownfish of many species. At times you can be "attacked" by some clownfish. They can be extremely protective, biting your fingers continually. Thank God they are only little things, if they were a metre or so in length, they would be more dangerous than great white sharks! There are also some turtles in this area and if you keep going east you will come across a gutter that runs to the south. This goes all the way to the island and even into it, forming a small cave. You can go and examine this now or leave it for a later dive. Return to the west and cross the wall and head west till you hit the reef which is the eastern side of the point that runs out to the north-west of the island. There is always some excellent fishlife here. Go to the north-west, just to the corner (do not go around as there can be strong currents). Come back along the reef, exploring all the small inlets. From here head south up into the shallows. There are some normally lots of small cuttlefish and many wobbegongs as well as a few firefish here. By now you should have done a dive of about 60 minutes at least. Head back to the mooring if you are short of air (it is unlikely you will be short of bottom time). On my 20 dives here I have averaged 70 minutes a dive. Visibility here is normally very good, in the order of 20 to 30 metres. Water temperature ranges from 19°C in late Winter to 25°C in late Summer. I can recommend the services of Dive Quest at Mullaway (02 6654 1930) or Wooli Dive Centre.